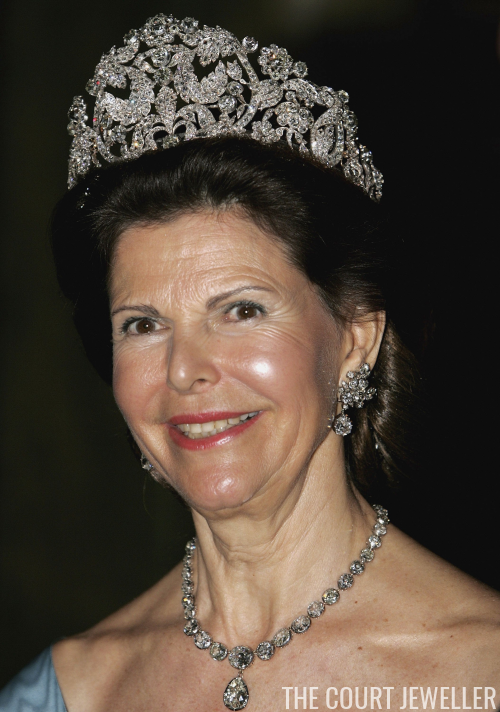 Queen Silvia wore the grandest diadem in Sweden's vast collection, the Braganza Tiara, with coordinating diamond floral jewels and the diamond necklace with a pear-shaped pendant. Crown Princess Victoria made an early appearance in the Baden Fringe Tiara, which has become one of her signature pieces; you can tell that she wasn't yet the primary wearer of the piece because the base is still wrapped in gray velvet to match Princess Lilian's hair. Victoria also wore coordinating diamond pieces: her small earrings, a simple riviere, and a small round floral brooch. Princess Madeleine wore her mother's diamond fringe -- later Madeleine's own wedding tiara -- with a seed-pearl choker, diamond and pearl earrings, and a round diamond brooch. Princess Lilian wore two favorite pieces, one from her own jewelry box and one from the Bernadotte collection. The tiara, the Boucheron Laurel Wreath, is the convertible tiara/necklace that once belonged to her mother-in-law, Margaret of Connaught. 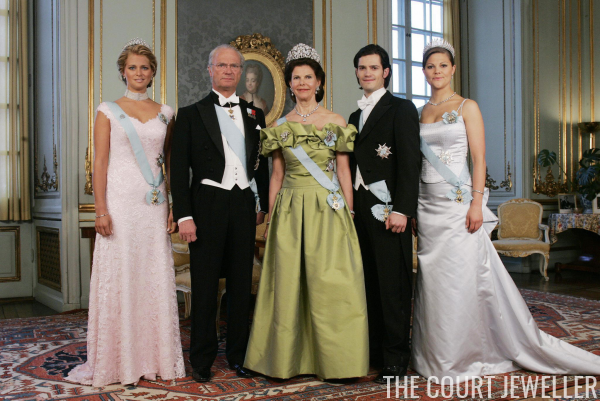 The diamond necklace was converted from a stomacher that belonged to Queen Josefina. In 2013, to pay tribute to Lilian, Crown Princess Victoria wore both the tiara and the necklace at Princess Madeleine's wedding. On this occasion, Lilian also wore diamond and pearl earrings and a diamond and pearl brooch. 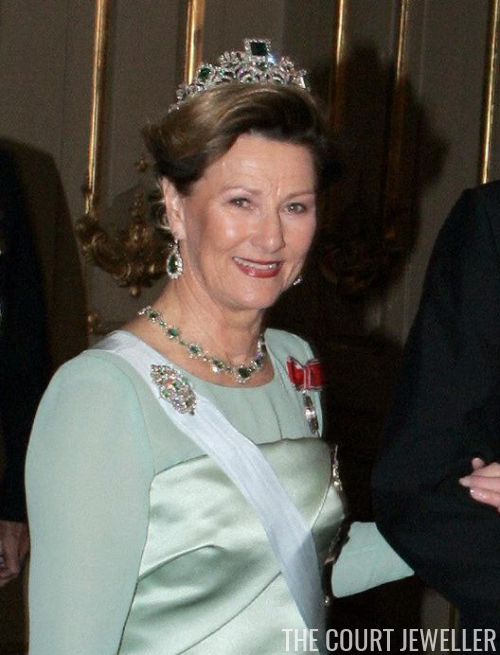 Queen Sonja of Norway wore pieces from one of her grandest sets of jewelry: the emerald parure. 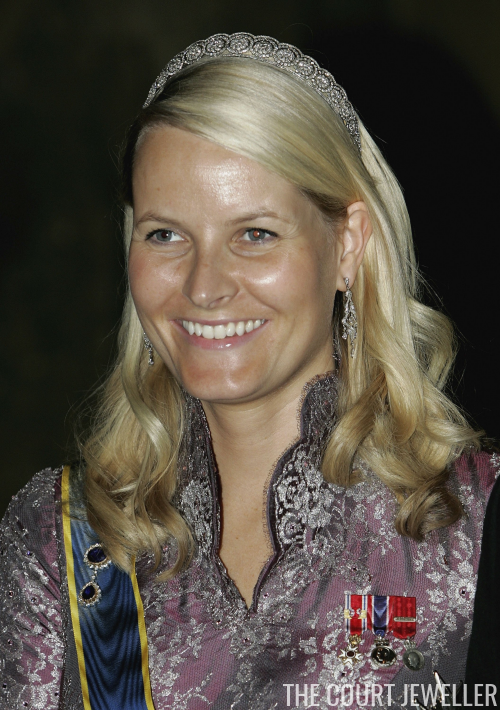 Crown Princess Mette-Marit wore her wedding tiara with Crown Princess Martha's silver wedding earrings, plus (I believe) the brooch from the amethyst parure. Crown Princess Mary also wore her wedding tiara, pairing it with the earrings and pearl choker from her collection of aquamarine jewels. Princess (now Queen) Maxima wore pieces from the Mellerio Ruby Parure, including the suite's gorgeous diamond and ruby tiara. Princess (now Queen) Mathilde wore her diamond laurel wreath tiara with a diamond floral necklace, diamond and pearl earrings, and a gem-set bracelet. Both Mathilde's and Maxima's mothers-in-law also attended the gala, as did Grand Duchess Maria Teresa of Luxembourg. She wore the Chaumet Choker Tiara, plus the convertible sapphire tiara/necklace. 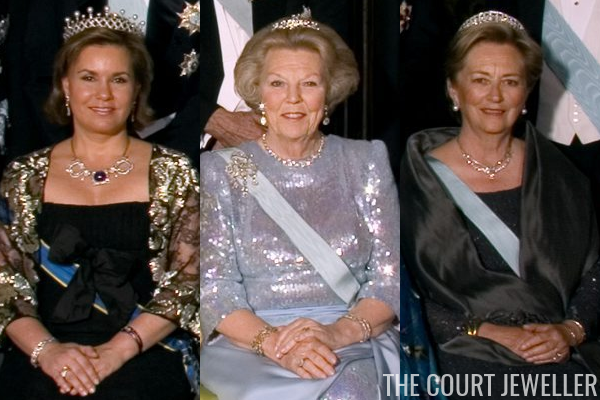 Beatrix wore Queen Emma's Diamond Tiara, which all but disappeared into her hair, with the family's Russian bow brooch. 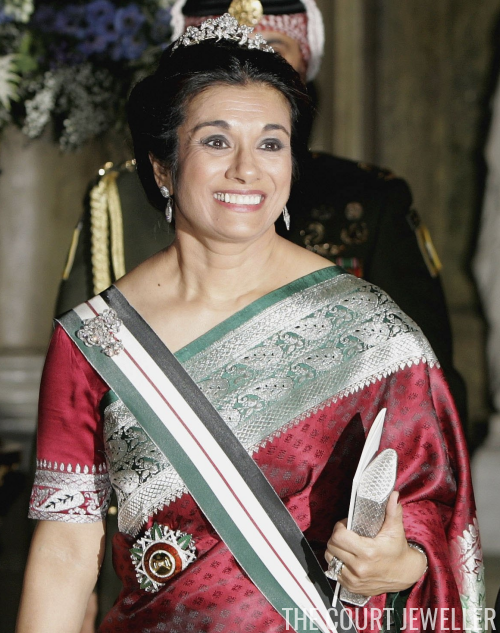 Paola wore another convertible tiara, the Diamond Art Deco Bandeau. The Jordanian royals were also at the gala. Princess Sarvath wore a lovely diamond tiara and brooch -- and check out the rock on her left hand! 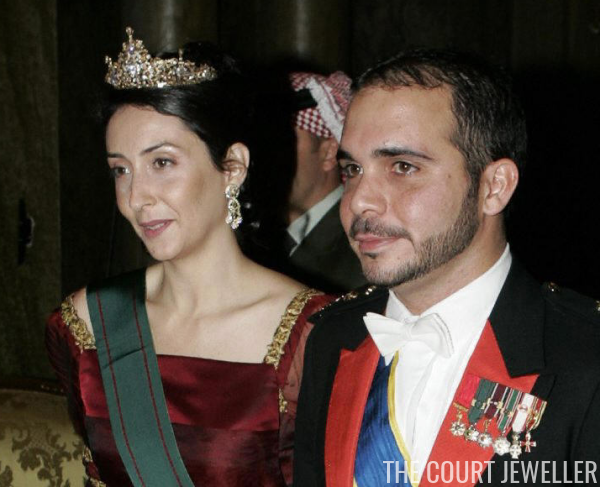 Princess Rym wore an intriguing tiara with a pair of earrings that look like they might be part of a coordinating set. 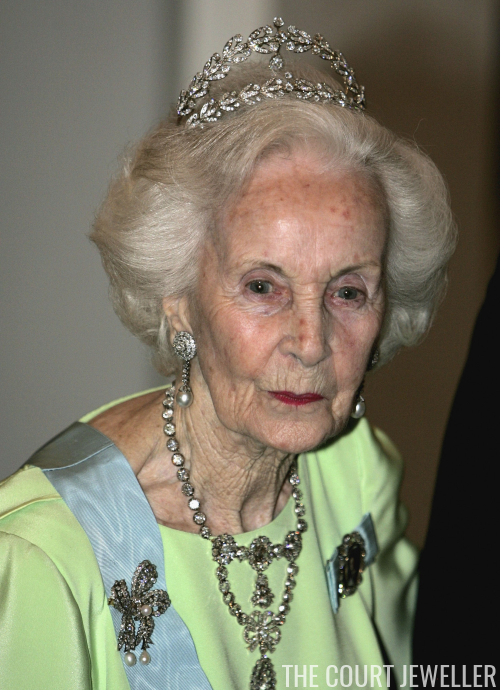 And one more tiara: Marie-Chantal of Greece donned the same JAR earrings and diamond bracelet from the night before, but for the gala she added her daughter's diamond fringe tiara and a small diamond brooch. Which gala jewels from this event were your favorite?